Subscribe to The Local Voice Weekly Dispatch & PDF Download – FREE OF CHARGE! Subscribe now and have TLV's Weekly Dispatch delivered to your inbox. It’s FREE to download, simply sign up for TLV’s Weekly Dispatch email! The Local Voice digital edition comes with tons of extras that you can’t get in our newspaper. TLV’s PDF includes five pages of events from all over Mississippi plus six additional pages of puzzles, solutions to all, and comix… and it’s now FREE to DOWNLOAD! Get music and entertainment listings in Oxford, Ole Miss, Water Valley, Taylor, Abbeville, Clarksdale, Tupelo, Tunica, Vicksburg, Corinth, Southaven, Greenville, and elsewhere in Mississippi. John Fogarty, ZZ Top, Five Finger Death Punch, Breaking Benjamin, and Ray LaMontagne are all coming through the amphitheater. Check out some great bourbon, learn about the women who making it, and help out Exchange Club Family Center. John Gunn Reflects on the great 2001 season. John Currence’s Foundation Move On Up Mississippi is hosting a bourbon festival & auction in May. Check out what all is up for grabs. What is the first thing you’ll do when the weather warms up? The Local Voice has Food & Drink Specials, Local Entertainment Calendar, Comix, Puzzles & Brain Teasers, Trivia, and more cool stuff to keep you entertained and well fed in the North Mississippi area. 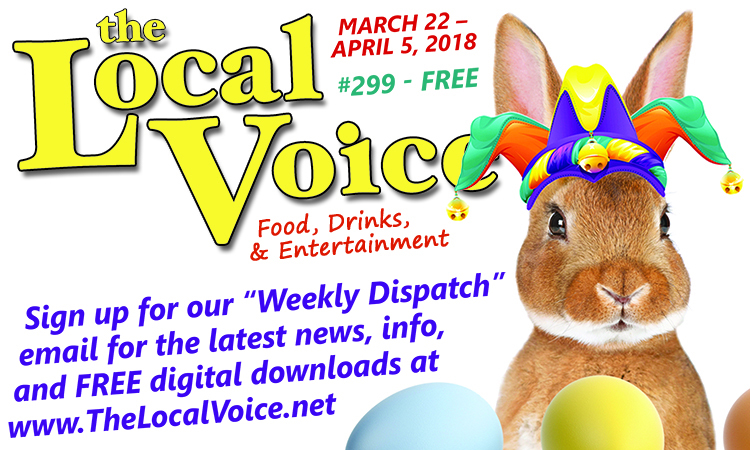 The Local Voice #299 newspaper is 16 pages and FREE at over 300 locations, but The Local Voice digital edition is 29 pages and has even more events and shows in North Mississippi. TLV’s digital edition has puzzles, comix, and solutions. Check out Entertainment in Oxford, Tupelo, the Delta, and beyond… North Mississippi events are in The Local Voice digital edition – download now! Brittain Thompson Brittain is an associate editor of The Local Voice, ex-journalism student, and bad noise maker from the highway town of Brandon, MS. The Local Voice is North Mississippi's Entertainment Guide. The newspaper is published every two weeks and distributed in Oxford, Ole Miss, Water Valley, Lafayette County, Yalobusha County, plus parts of Panola and Marshall Counties as well. The Local Voice PDF is distributed worldwide and contains even more information and pages than the newspaper. The Local Voice websites and social media are updated daily with new and interesting local information and content. For Editorial, or General Inquiries, please email thelocalvoice@thelocalvoice.net or call our Editorial office: 662-832-3574. For Advertising information, please call 662-232-8900.